I found these words today in a book of quotations from Saint John Paul II, and I knew immediately that I wanted to post them here. The text is taken from an Angelus message from 1994. The images that accompany them below, however, came as an unexpected and deeply moving surprise. "Authentic love is not a vague sentiment or a blind passion. It is an inner attitude that involves the whole human being. It is looking at others, not to use them but to serve them. and to suffer with those who are suffering. so that no one may continue to be deprived of what he needs. Love, in a word, is the gift of self." 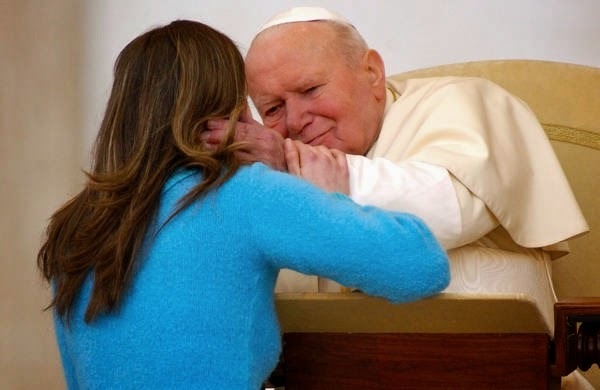 I decided to google for an image of John Paul II expressing this authentic love in a concrete situation, with reference to another human being. I had no doubt that there would be many examples and indeed there were. But I found the entire encounter presented in this video especially compelling. In April of 2004, John Paul II presided over a world youth gathering for the last time (the "diocesan World Youth Day" in Rome). There was a woman from Krakow, about 23 years old, who spoke with great ardor about her own faith and her generation's experience of the spiritual fatherhood of the Pope, as well as her hopes for Poland's young people (she appears beginning at 2:10 in the video). The young woman, Paula Olearnik, told the Pope that he had inspired her take up the study of philosophy. After speaking in Italian and Polish, she approached the Pope with tears and hugged him and they spoke personally for several moments. The images below and others like them are apparently well known, although I had never seen them before. The authentic love expressed here speaks for itself. Today, Dr. Paula Olearnik teaches political philosophy at the Jesuit University in Krakow.